Commander, 116th Penn. Vol. Inf. Saint Clair Augustin Mulholland was born on April 1, 1839 in Lisburn, Ireland. He immigrated to the United State in 1846 with his parents first settling in New Jersey and then moving to Philadelphia in 1850 where he remained, apart from his numerous travels, the rest of his life. Though he worked in a printing shop and then as a painter of window shades Mulholland showed an early interest in military life. Prior to the Civil War he was active in the Pennsylvania militia, where he became an expert drill instructor. During the early days of the war Mulholland sought to recruit men for a unit to be attached to the Irish Brigade. Though this was initially unsuccessful, Mulholland did recruit two companies of men for a regiment that would become the 116th Pennsylvania Volunteer Infantry. He started as a lieutenant in June, 1862, but because of his military experience and recruiting skill, he was mustered in as lieutenant-colonel of the 116th when it entered Federal service on September 1, 1862. Colonel Dennis Heenan and Mulholland, were both Irish born, and both had been active in Irish militia units before the war and both had attempted to raise Irish regiments for Federal service in its first year. Though the 116th Infantry was not entirely composed of Irishmen they were far more numerous than any other foreign-born element in the 116th. Because of this stature, the 116th Pennsylvania Volunteers joined General Thomas Francis Meagher's Irish Brigade at Harpers Ferry, Virginia on October 9, 1862. This brigade was composed of the 63rd, 69th and 88th New York and the 29th Massachusetts regiments. By the fall of 1862 the 29th Massachusetts had been replaced by the all-Irish 28th Massachusetts and gave the Irish Brigade the strength that Meagher had originally hoped for. The 116th Pennsylvania shared in all of the brigades fights from October, 1862 until June, 1864, when the brigade left the regiment. The 116th Pennsylvania always enjoyed a good relationship with the Irish Brigade and was loath to leave it in 1864. When Colonel Heenan fell wounded at the Battle of Fredericksburg, Mulholland took command of the regiment and held it until late 1864 when he was given command of his own brigade. Colonel Mulholland's performances proved what kind of officer he was. Though he was wounded at Fredericksburg and being able to walk only with the assistance of a cane, he returned to camp to share the hardships with his men in the field in 1863. A report in the New York Irish-American written by one of his own men stated that under his leadership "every officer and soldier would charge to the cannon's mouth." Mulholland impressed both soldier and senior officer alike and was a personal favorite of Major General Winfield Scott Hancock, whose friendship led to a lifelong relationship. At the Battle of Chancellorsville on the night of May 4, 1863, General Hancock looked for an officer he could depend upon to protect the army in a rear-guard action. He chose his friend Lieutenant Colonel Mulholland. Hancock fully expected that these men would be captured and told Mulholland that he would try to exchange him at the earliest opportunity if captured. Mulholland accepted the risk and with 400 men he was able to protect the army's retreat and did escape capture and brought back almost all of his men across the river before they could be cut off by the advancing Rebel forces. Mulholland's heroism was rewarded with the Congressional Medal of honor. 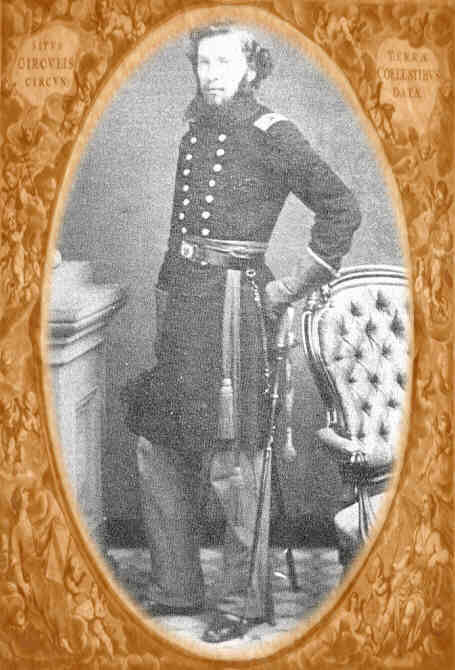 In early 1864 General Hancock gave Lieutenant Colonel Mulholland the opportunity to return to Philadelphia to recruit enough men to bring the 116th Pennsylvania back to full strength. With this accomplished, Mulholland was promoted to colonel to lead the restored 116th into the summer campaigns. Before the end of the year Hancock saw to it that Mulholland was given command of his own brigade: the fourth brigade of the first division of Hancock's Second Corps. As brigade commander Mulholland was again singled out on two different occasions in actions at Petersburg, Virginia. After the war, and upon Hancock's recommendation, Mulholland was brevetted brigadier general and major general for his distinguished service during the war. The background music is "The Foggy Dew"